EDIT UPDATE AFTER ALMOST A TWO YEAR WAIT! Atari 5200 Tempest now out at Atari Age! For 15 years, the existence of an Atari 5200 version of Tempest was thought to be only myth. No prototypes had ever surfaced. A crude 2600 version had come to light, along with a prototype box. Then, in 1999, an unfinished working 5200 prototype appeared on eBay. 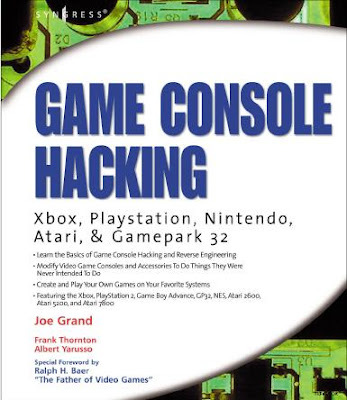 The game was eventually dumped and the binary freely distributed around the Internet. 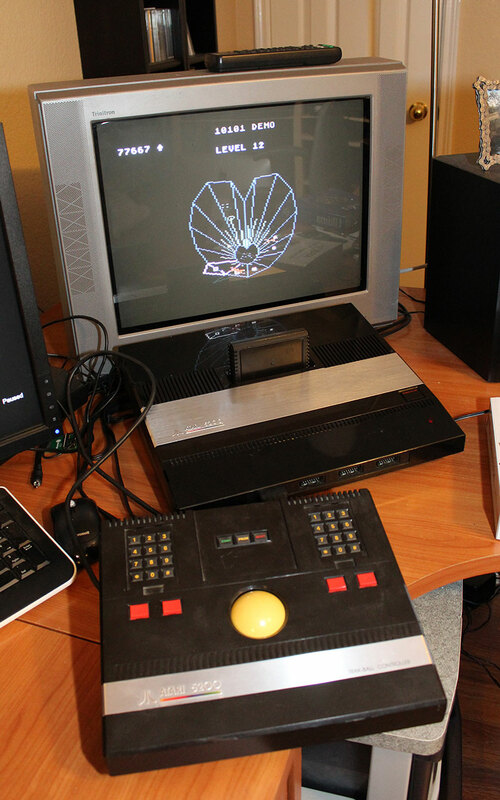 Another decade has gone by since the game's discovery, and the original Atari 5200 Tempest programmer, Keithen Hayenga, worked to complete Tempest so it could finally see the light of day in completed form! 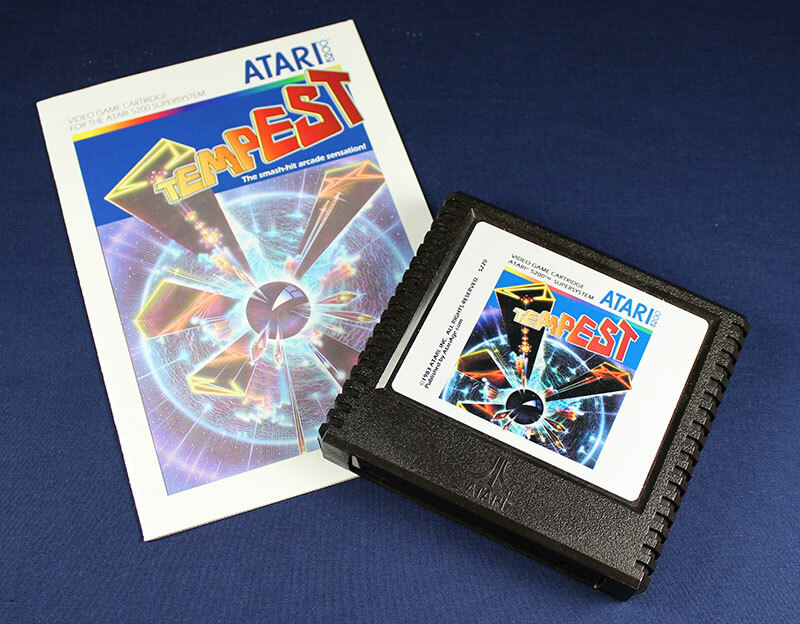 Tempest 5200 includes the game cartridge with glossy label, twelve page full-color, glossy manual, professionally offset printed box using chipboard paper stock, and cartridge insert to keep the cartridge in place. Only 250 boxed copies of Tempest will be produced! After that, the game will be sold without the box. If you want a boxed copy of the game, don't wait too long! crux wrote: I kid you not, I was just researching the dual stick 5200 thing today, after half considering getting a 5200 for the upcoming long lost Tempest port. I have been Googling and hitting the Atari Age Site for TWO YEARS with bated breath waiting for this great game, TEMPEST for the 5200! Atari Age wrote: Tempest was Atari's first color vector arcade game, released to arcades in 1980. Known for its frantic, addictive gameplay, Tempest was one of Atari's most successful vector arcade games. Versions of Tempest were being developed for Atari's 2600 and 5200 game consoles, but they were never completed or released commercially. A box for the 5200 version of Tempest is actually visible in the movie Cloak & Dagger. We'll have a playable demo of Tempest at our booth, and you'll have an opportunity to speak with ex-Atari employee Keithen Hayenga. AtariAge will begin selling Tempest at some point after CGE, complete with a professionally printed box, manual and label. Good Deal Games - When did Tempest come along? Keith Hayenga - After RealSports Baseball, Tempest was the first game that I got to choose to work on. I got great cooperation from Dave Theurer who programmed the arcade version. He gave me listings that I could borrow from. Good Deal Games - The graphics in the unreleased prototype are fabulous, and the sound effects are incredible. Are they the arcade SFX? Keith Hayenga - I was able to use the sound files exactly because Tempest and the 5200 used the same sound chip. I could also use all the tables that told which levels each set of creatures came in. But since the arcade game was vector graphics based while mine was bitmapped, I had to make trade offs. I didn't have enough sprites to show all of them that could exist at the highest game play levels. Good Deal Games - So how complete did Tempest get? Keith Hayenga - The first prototypes, which were shown at an earlier Classic Game Expo, just had the beginning of the game, just enough to show the playing field tubes. It went out just as a preview to show buyers what we were intending to get out for the next Christmas buying season. After I got in some game play, another version was created just to test how far I had come. That is the version that you got a copy of. It mainly had the gun rotating and firing, plus the flippers rotating around the top of the tubes, plus zooming down the tube. I was very surprised to see that anyone had resurrected that version. Good Deal Games - This was towards the end of the original Atari before the crash. Is that why the game never was finished? Keith Hayenga - I continued to work on Tempest right up until the Trammiels bought the company and let most of us programmers go. I had added in spikes and was working on the tankers and fuseballs when we folded. Unfortunately, the ROM lab and testers were the first people to get laid off, so there was no one to burn a copy of my latest version. So when I tested the version you have I was hoping to see the spikes, etc. Oh well, it was still more than I ever expected to see and hope it works out for you! Sounds beautiful. I can attest to that sound chip having played 5200 DEFENDER and 5200 ROBOTRON which sound perfect, a shame the 7800 dropped the sound quality. Okay so the graphics in 5200 Tempest are raster, not vector clean as original Arcade Roms. TEMPEST and TEMPEST TUBES are much better emulated on MAME. There are also Arcade compilation packs released for PS1, PS2, Dreamcast, XBox, Gamecube as well as current Gens. There is even remakes such as the great TEMPEST 2000-3000, X3 and newer downloads such as TYPHOON 2001 for the PC. PS1 Tempest X3 is actually pretty decent. So why the excitement over the 5200 version? Well the Arcade came out in 1980. 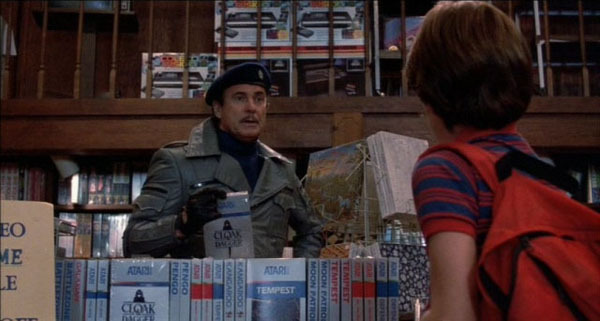 The 1984 movie cloak and dagger had fake boxes on display of various systems including TEMPEST and BATTLEZONE. I am still waiting for not the Arcade, that CLOAK AND DAGGER Cart, the one with the secret hi-res plans. Been waiting since seeing that movie on Laser Disc. A constant Jog-Shuttle Pause for another look. Throw in Tron and Last Starfighter Arcade games featured in those movies too. Okay raise your hands, who would kill to be in that store with new Colecovisions above right now! Oop sorry I tend to side trak er track. Anyways as mentioned earlier there are many better versions of TEMPEST. The actual arcade, or MAME with a dedicated Spinner. The 5200 shines because, better then PS1 Nyco Trakball in itself a jewel, the huge beautiful 5200 Trakball, a real monster. Not a spinner but I think this will be a lot better, having played Tempest with a Trakball in Mame. Instant movement, start and stop spinning of the Trakball with very precise tight control. Come to think of it, 5200 Wico joysticks with the self centering potentiometers may just work out too. Either speed adjustment based on how far push of the stick or a screen direct correlation to stick position? Is the 5200 Trakball huge? Compare the pics, shows the stability of this beauty. ALMOST AS BIG AS THE 5200 CONSOLE. Last edited by CRTGAMER on Fri Jul 28, 2017 12:07 pm, edited 38 times in total. Cloak and Dagger Cart when I was little and I thought he had the coolest game in hand. Tempest is a p. awesome game. I need to look into getting myself a 5200. Octopod wrote: Tempest is a p. awesome game. I need to look into getting myself a 5200. The MAME version is a better hold over. Arcade TEMPEST and TEMPEST TUBES, playable with PC-Mac mouse or trakball. Getting Tempest on the 5200 is graphically not as good as previous compilations that have already come out. Although what is cool is that the Atari 5200 sound chip is identical to Arcade games of the era. Just trying it out with the trakball is what I'm looking forward too. I think also the collectibility bug having waited for freeken ever to get this canceled game! 5200 definitely a unique machine. I think the only official home version of SPACE DUNGEON, twin stick at that! All the early Raster Williams classics makes this the console to get. DEFENDER, ROBOTRON and JOUST are perfect. Joust on the 7800 has just slightly more color in the sprites but the sounds of these early 5200 arcade conversions are to the tee! For some reason the 7800 lost some of the sounds, maybe having to emulate the 2600. Very unique version of SPACE INVADERS and GALAXIAN with variable speed side to side of your ship or use of trakball. Atari STAR RAIDERS and MINER 2049er (Elevator levels) actually makes use of the number pads very well. Only downfall is the crappy controllers, no not because of the non self centering pots but the cheap flex-PCB behind the fire buttons. Either a mod or Wicos are in order. Be careful when you buy a 5200. The 4 port requires a proprietary Auto Switch and power brick for the power-RF cable. Amazing that the RF cable also powers that 5200. 2 port model has a separate power lead. I have looking into a 5200 paddle spinner mod if the 5200 trakball or Wico sticks doesn't work out. Maybe even a couple micro switches in place of crappy flex-PCB fire buttons. The paddle spinner knob fun begins on page 419. Re: Atari 5200 Tempest now out at Atari Age! A bump of a two year old thread for something special that just got released. See the OP. Why not just get Tempest 2000 on the Jaguar? Yeah, the Jaguar isn't an easy system to come by, but then neither is a 5200. And Tempest 2000 looks a lot better. BurningDoom wrote: Why not just get Tempest 2000 on the Jaguar? Yeah, the Jaguar isn't an easy system to come by, but then neither is a 5200. And Tempest 2000 looks a lot better. It plays differently. I like Tempest 2000 more but purists will prefer the original. I nearly ordered SCRAMBLE for the 7800 when that came out. Unfortunately I had no money. Tempest 2000 is pretty good. I played the PC version and the followup Tempest X3 on the PS1. As described in the OP, the 5200 version has historical collectable significance. It has been an unfinished Beta for decades and now finally a complete game coded by the original programmer. It is not too often you can buy a retro game decades later as if new. I think this even beats Duke Nukem Forever in development time. 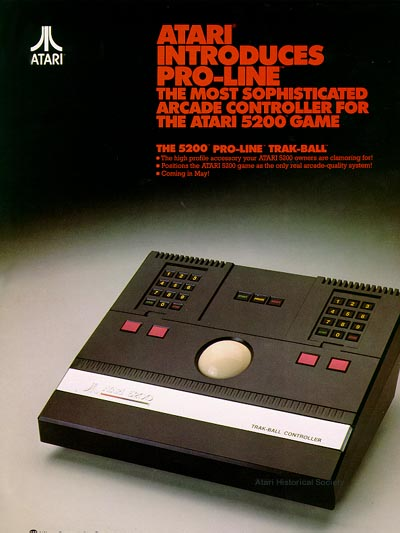 I own an Atari 5200 and there is a beautiful Arcade sized 5200 Trakball to try it out with. Looks like an awesome set up. Atari 5200 Tempest Shipping Feb 27 at Atari Age! d123456 wrote: Does it play well? Looks like an awesome set up. That picture is the early testing phase, but yes with the Arcade sized 5200 Trakball should play beautiful! I'll post a full review when mine comes in. A nice surprise in the Atari Age thread! Albert at Atari Age wrote: The manuals have arrived. Will start shipping everyone's orders tomorrow. To quote the voice in another Tempest, the PS1 X3 version: YES! YES! YES! Been waiting for Decades for this game to come out. No really, after seeing the made up boxes in the Cload and Dagger movie on Laser Disc back in the day. My 5200 Trakball is cleaned up and standing by!